Provide comfort for the family of Francis Ruisi with a meaningful gesture of sympathy. Francis Edward Ruisi, 86, of Westerly, RI passed away on Monday night, Jan. 28, 2019, at The Royal, Westerly, RI. He was the beloved husband of the late Esther Grills Ruisi. Born in Westerly, RI, he was the son of the late Anna and Leo Ruisi. “Frank” leaves behind his daughters, Marybeth Taylor and her husband Steven, of Phoenix, AZ and Julie Ruisi and longtime boyfriend Robert Rofrano, of Westerly. He has three wonderful grandchildren, Hillary Bravo and her husband Claudio, of Tucson, AZ and Robert and Madelyn Taylor, all of Phoenix, AZ. He was predeceased by his siblings, Lillian, Clara, Joseph, Peter and Leonard Ruisi and Gloria Vrakapedis, formerly of Astoria, NY. 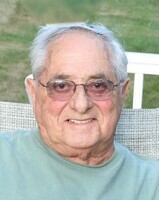 Frank, graduated from Westerly High School in 1951 and then served in the Korean War. He was an Electrician by trade, graduating from Norwich Technical School. He owned Allied Electric where he worked on many large, local projects. Franks’ skills were very sought after. He was hired at McPhee Limited where he worked as a project manager overseeing The Hartford Civic Center, L & M, Norwalk Hospital and Foxwoods Casino. “Frank, Frankie, Pears, Dad, Papa”, were the names he would answer to. Truth be told, Papa was probably his favorite! People loved being around him because of his quick wit and sense of humor. He was funny, generous, sincere, honest, fair and smart! Pears, as they called him, had a remarkably close-knit group of friends that started on Westminster Street and then lasted a lifetime! He enjoyed boating, golfing, or playing pool in our basement with his buddies and Wednesday ‘dinners’ at the casino with Esther’s family. Papa loved summers as that was when all his family came to RI to watch his Red Sox and celebrate Lobsta Fest! He loved his friends and his family unconditionally. The love he had for his soul mate Esther, has now come full circle as Frank and Essie are together again. To plant a memorial tree in honor of Francis E. Ruisi, please visit our Heartfelt Sympathies Store. Like so very many other friends of Frank, my wife and I had a very special relationship with both Frank and his recently deceased wife, Esther. Most of our interaction and communication occurred weekly on Saturdays just prior to Mass at St. Clare Church. Much to Fr. Ken’s dismay we would chat for 15 - 20 minutes while Esther would ‘fill us in’ on the week’s happenings in Westerly. Following her death, Frank would share with us news of his week’s activity - never failing to mention how much he missed his wife. To know that they are together once again tends to soften the pain surrounding his death. Frank proved to be a huge figure in our community, and he will be missed by all.